One of the concepts throughout this show is one of family; Season One was primarily about the formation of it, and Season Two served to define what it meant to everyone. Every major decision on Moya is weighted with how it will affect the family as a whole – even Rygel keeps his shipmates and Moya in mind when he’s scheming. It’s debated both in-universe and out who the heads of the family are. Even in this episode, the role of the Mother and Protector is shared between Moya and Zhaan; the quote above exemplifies how it refers to the ship, and Zhaan’s farewells show how she puts herself in that position more often than not. No mother wants to see her children die before her. A mother is a protector, a provider; giving of herself so that her family might continue. Such is the case with Zhaan. Each of her friends on Moya is someone who she has touched personally; they’ve benefited from her counsel, her treatments, and her very presence. Every one of them is changed because of her, and for the better. This episode hurt. It hurt the first time I watched it, and it hurt even more this week, because I knew it was coming. But out of all the deaths we’ve seen on the show thus far, this one feels right. Zhaan sacrificed herself that her family might live. None of them wanted to see her go, and her absence will affect all of them for a long time to come. But as families do, they will adapt. They’ll learn to function without her; partially because she has never truly left them at all. Stark has already started to take over the spiritual center of the crew as he comforts Aeryn (who is, in turn, trying to comfort him), and the memory of her actions and the actions she would advise in the future will remain. Her final appearance in the mirror as Crichton works through his grief is representative of that; she has left a part of herself in him, in everyone, and that part will always remain. They are her family, and she watches over them. There’s some interesting camerawork in this episode, including – but not limited to – the ever-present close-up tilted shakycam as someone’s running through a corridor talking quickly about the Crisis Of The Week. This technique is what many people would consider to be signature of Farscape – so much so that it is parodied by Stargate: SG-1 in one of the best episodes of the final season. It’s used probably the most it has been up to this point in this episode, shifting rapid-fire between multiple characters who are all loping off to different sections of Moya. It’s a neat subtle bit where D’Argo gets the idea to scan for an invisible person with the Mystery Ship’s green scanner lights. That ship, if I remember correctly, comprises most of D’Argo’s plot arc for this season, so it’s nice that they’re giving it its due a little bit at a time. 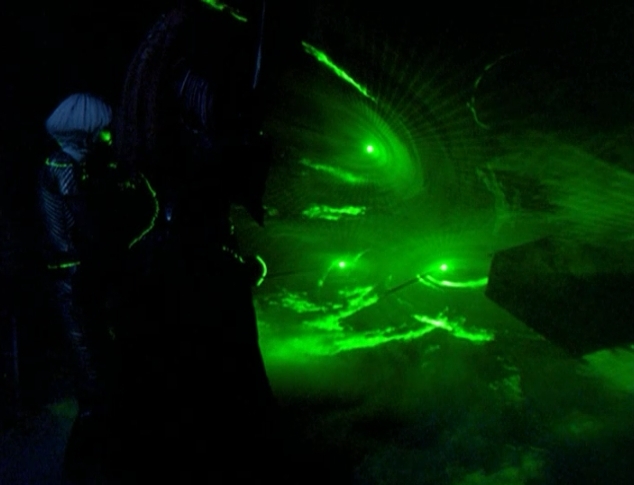 On a similar note, the demise of the Wormhole Serpent is evocative of the third episode of Stargate: SG-1 and how they dealt with an invading snake. I’d love to do a Stargate rewatch project with someone at some point. It’d take years unless it was more often than our own weekly basis, however. Wormhole Snake. That lives in a tunnel. I just got it. Between the writings of Tessa and myself, we’ve spent a lot of time discussing this show’s inability to kill off its lead characters despite numerous attempts at making us think they will. People either die suddenly or begin to mourn an impending demise, only for the gods of plotting to turn around and make them all right. Consequences are teased at, but quickly made moot. Relationships are strained, then settle back into place. Maybe it was some lousy plotting on the part of otherwise sharp and inventive writers. Or maybe it was planned so that this one episode would be all the more haunting. In this episode, Zhaan dies. She dies dies. There’s no reversal by episode’s end, no reconstitution to surprise us in the coming weeks. She’s gone. We already know she’s dying, but in the thick of the events going on, with everyone running left and right and battling snakes and literally kick-starting Pilot, her visibly deteriorating state feels secondary to the narrative until a situation arrives where one person has to sacrifice themselves and, despite heroic offers from John and Aeryn, Zhaan herself takes the bullet to rescue them all. They are her children. Her teachers. Her loves. They gave her meaning and led her to peace following the darkest point of her life, and she bids them farewell in a death that’s both violent and serene as the alien ship shatters around her and she’s vaporized along the raging wall of a wormhole. While part of me wants to argue that the moment was slightly cheapened by the constant fake-outs we’ve encountered up till now, a large chunk is arguing that it was actually made stronger. There is a disbelief lingering in the air that all will be made right and whole at some point down the road, but that makes it all the more tragic when such hope fails to play out. I’m curious to be reminded if this will be reflected by the characters, who themselves must be thinking back on past resurrections. Despite her peace, though, one has to wonder if Zhaan’s goddess will smile on her her sacrifice which, while it rescued her friends, will condemn innocent families to execution. Neeyala’s people are a prickly bunch, but their attempt to sabotage Moya and save themselves is justified. The wormhole data they’ve collected is revolutionary, and if the ship containing it doesn’t return home, the loved ones of each of the scientists on board will be killed. Yes, it’s a fascist government doing fascist things, and that shouldn’t be looked upon sympathetically, but the people who will be victimized are still innocents trapped in a bad system, and their lives are no less important than those on board Moya, despite them existing off screen. It’s a fantastic ethical quandary that cuts deep to the roots of self preservation as our “heroes” condemn others to death to save themselves. We still cheer when they triumph and make it out safe, but, much like the Interion that was killed to repair John’s brain, the blood of the dead is as much on our hands as it is our characters because, let’s admit it, we want our leads to live, regardless the cost. Only four episodes in, the “Season of Death” is proving to be very accurate, and lingering consequences are already being set in place that will start to haunt our characters for the choices they’re making. Which brings us to Jool. She’s still the high-and-mighty elitist who loathes everyone about as much as they did each other back when the series began, but she’s being put in her place. John, the man who lived at the expense of her cousin, who had her bound and gagged when she tried to enact revenge last episode, cuts her free, puts a gun in her hands (possibly the same one she pointed at him), and trusts her with something that needs to be done to save everyone’s asses. She doesn’t fit in at all and even Pilot asks who this strange woman is, but it’s finally starting to sink in that she’s not the only one who’s found themselves in a chaotic position they never chose to be in. It’s her turn to adapt and accept. During the first half of this two-parter, I was surprised they chose this story to spread out over multiple episodes. Moya gets snagged with another ship in a wormhole, they have to pull apart. Seems like something that could be done-in-one. But I’m glad they didn’t. There’s so much more going on, so many themes that need to be explored as one character arc comes to a close as another begins, amidst all the other people running around in a white-knuckle pot boiler of a plot that never once moves slower than the crafts tumbling along the wormhole. And it says a lot about John that, ultimately, he chooses to throw away the wormhole data and stick with Moya. These are his people, now. This is his home. He’d still like to go back to Earth some day, but not at the cost of what he’s built. If he does it, it’ll be on his own terms. And praise the goddess that someone realized they took Rygel too far last time, because he’s awesome here. The Dominar is still for abandoning Moya, but he doesn’t run away when the others need him to help with the work. And when the final chips come down, he sticks with them instead of bailing, and even ends on a scene that will send shivers of pleasure through the loins of the handful of Rygel/Pilot shippers that undoubtedly exist. Ah, Zhaan. If you have to go, do it like this. Little personal moments with every other character, a fantastic farewell speech, and sacrificing yourself for the friends you love by dropping yourself into a wormhole to be dispersed into your component atoms. She sums up every person in a single word, she dies fulfilled, and she has one of the most heartbreaking goodbyes to a loved one that I’ve ever seen. When he realizes what she plans, Stark goes into full on panic mode. Running around a damaged starship that has begun to resemble a maze with multiple dead-ends, unable to get to Zhaan to stop her, in the end only able to assist her to her final rest. The only upshot is that, in crossing her over, Stark retained a part of her essence. A droplet of her peace and love to counteract all the evil he’s soaked up over the years. Aeryn gets a hairball from Jool. I just find that hilarious. It won’t be the last time. Her color-changing hair gets everywhere. And that metal-melting scream will get really, really annoying. The ship is made of metal! And the guns, the comms, the neural clusters, the consoles, the tools… She’s definitely where Crichton was two years ago. Only major difference is that she started with translator microbes and a partial knowledge of alien races. If she isn’t lying, she was on a twelve-planet spring break cruise when her cousins got plagued and they were all frozen. She’s an intelligent kid, and she portrays it well. Zhaan’s line, “Your excuses have failed him again, John.” It seems like a low blow. Accurate, maybe, but low. Harvey continues to develop independent of Scorpius. No longer will he be banished to the dumpster. He shows up in a tux, pulls Crichton into a memory of spring break, and declares that he looks good yeeeeah! He displays his ability to pull memories out in real time, interact with them, think independently, and point things out to Crichton. The neural clone remnant is still demeaning and manipulative, but he’s being a hell of a lot more helpful. D’Argo is completely enthralled with the mysterious energy-shielded silvery fish-looking ship thing. Why exactly it seems familiar to him is unknown, but he’s intuiting the controls quickly. Cracking open the back door, activating some kind of scanner; whatever the thing does, he’s going to figure it out. And then it may be useful. For now, it makes a fantastic place to withdraw and think about things. Neeyala dies on the Phaztillon Generator, and with her the hopes of her research team and every member of her family. One can’t help but wonder what would happen if the Moya group were to wind up facing the Pathfinders, forced to explain what happened. Which may actually happen. Neeyala’s final act was to infuse Moya’s hull with her vessel’s distress beacon. Wherever the Pathfinders are from, they’ll be looking for this vessel. And they’ll find Moya. And then, oh then, there will be trouble. The only good news here is that they must be pretty far away – with no knowledge of Uncharted species or translator microbes, there’s no way they’re local. The bad, with wormhole technology they don’t need to be. The final minutes are… *sigh*. Everyone reflecting on Zhaan’s death in their own way: Pilot working with Rygel in attendance, Chiana limping around telling Jool how to keep up on Moya, D’Argo brooding in his ship, Aeryn fixing something as an excuse to stay close to Stark, and John reviewing a Three Stooges movie with Harvey. During that last one, Harvey (back in full Scorpius getup) comments on Moe slapping Curly, “Why is it always the gentle ones that suffer for everyone else’s ambition?” Crichton reacts… poorly. Tons of season 4 spoilers on the commentary this time. Avoid it until you’ve seen, oh, up until about 4.06. That’s one of the difficulties with commentary, it’s usually recorded a year and a half after the episode itself. I said last episode I was going to need to see more of Jool before I could decide how I felt about her. I’ve decided. I don’t like her. It would seem that she’s not going anywhere, though, so hopefully she’ll give me some reason to actually give a damn about her. Something sort of similar happened when Chiana was introduced back in Season 1. She wasn’t a part of the starting crew that we got attached to right at the start of it all, and I really didn’t know what to make of her right away until I got to see her in action for a bit. The difference here is that I started off fairly neutral with Chiana, with no real reasons to dislike her, while Jool is rubbing me the wrong way right out of the gate. Her appearance, her attitude, her casual insults to the rest of the characters (she called Rygel an animal and for that she must pay >:( ), even her super powers are about as irritating as they can get (she screams and things melt. I hope to Luna we don’t see her needing to make use of that very often). This is possibly made worse (or at least brought clearer into contrast) due to the fact that we lose one of the original crew in this episode for good. Yes, they did it for real this time. And it was actually a very powerful and emotional scene that did full justice to the character and gave her a proper farewell. It’s not the first “death” in the series to be done well, but I do agree with Kevin that it’s the first one to actually feel “right”. It definitely feels final, and there’s no odd loopholes surrounding it or hints that it may not be permanent. I have to disagree heavily with Noel that the fake-outs up to now strengthened this. See, the only reason I’m even buying this one as it is has to do with the meta-knowledge that Virginia Hey was having allergic reactions to the Zhaan make-up and couldn’t continue the role. Had I not known that? I would be waiting half the season looking to see if they brought her back suddenly, and wouldn’t believe they had actually killed her off for real… well, probably until the season was over at this point. If I was waiting in the hopes that she was going to be revived and have that hope dashed repeatedly, then yes, I would agree with Noel’s assessment. But it wouldn’t be hope, it would be dread. Not because I don’t like Zhaan as a character, but because I’d hate to see such a powerful death scene cheapened yet again by an overused plot twist. When I come out of a death scene not thinking “oh my gosh, I hope they’re not actually dead”, but rather, “goddammit they’d better not do this AGAIN”, something has gone seriously wrong with the storytelling. I hate that I’ve gotten this cynical over the concept of character deaths in this series, but last season trained me to expect the worst when it comes to the handling of those plot developments. That said, this is a huge improvement on the way the show has handled the concept up to now. I hope that it’s a trend that continues (by which I mean the inclusion of major consequences to incidents, not necessarily characters dying). Speaking of consequences, Moya’s pretty badly beaten up now. She was very close to being killed outright over all this, and has only barely escaped with her life. I’m curious to see whether or not there might actually be time spent with her seriously handicapped due to having tons of repairs needed. Rygel had his awesome moments in this episode, which is great, but it makes his actions last episode seem even more glaringly pointless. Other than having his nose broken, nothing really came of his Season One-esque antics, and now he’s suddenly regained his character development and everything’s fine. I love how ecstatic he gets upon hearing that Pilot actually likes him. And D’Argo has a new toy to play with. Honestly, I’m a little surprised that the Disaster Area ship apparently came apparently unmanned (if it didn’t there’s another person on board Moya right now that we aren’t aware of yet). D’Argo spends a while playing with the ship to see all the nifty things it can do, and it does seem pretty nifty. He’d better just hope the thing isn’t also armed, or that could spell trouble for the gang when he accidentally blows a hole through the hull. Hey guys. Still been following the blog, but never commenting. Having a new girlfriend to introduce into this Crazy Frelling Awesome show tends to do that. However, given we just finished this episode ourselves, I may as well make a comment. This episode was hard for me to deal with at the end of it. I’m with Kevin. It was hard watching it the first time, but it was even harder subsequent times. Especially with the girlfriend sitting next to you, not understanding why your lips are quivering so much. Anticipation really is the worst part. Watching something terrible the first time is tragic. Knowing that it’s coming the second time? Much worse. Speaking of, guess what’s up next week? I love the moral greyness of Farscape. In this episode particularly, we get a very realistic view of war, violence, crime, etc. People don’t like to think that morality in conflict is ambiguous, it’s easier to think it’s black and white. Stargate tended towards more of a stark good guys vs. bad guys approach (though not always) But reality isn’t that easy. People fight to survive, they fight to protect their families. And they kill or let others die to accomplish this. Most people don’t dream of growing up to become the bad guy, they’re ‘forced’ into it, they’re a victim too. And it doesn’t feel good to see them lose. Farscape doesn’t sugarcoat this, it underscores the black and white in every choice. You don’t leave this episode feeling relieved or happy that Moya&crew “won.” Not at all. See, I disagree. I like that the characters in Farscape develop naturally, meaning they don’t make a cheesy about-face, they keep the characteristics that in real life are pretty difficult to shed. Rygel was a selfish dck, and he continues to be a selfish dck, really for the whole series but he’s an evolved one. When he does something good, or at least goes along with the group decision to do the right thing, it’s all the more meaningful because you know he really drawn in a different direction. It’s the ambiguity again. You can have someone who is willing to be a team player and deep down is really good, but can also make incredibly, unforgivably selfish moves. I’ve been re-watching for awhile now, and considering it has been cutting into my work/social life for years since I first saw the series on SciFi, I thought I’d comment as well. It’s a hell of an episode, after all. I think this is the only episode in the entire series where I’ve actually shed tears (well, except at the end of Peacekeeper Wars, we all know why). Zhaan was an incredible character, and the peacefulness in which she departs is only augmented by everyone else’s grief on the ship. Stark’s desperation as he tries to get to her before she’s gone only adds to the audience’s expectation. Those cuts to Stark sunning around “Decompression, decompression… what to do…” drove me nearly up the wall, that I remember fidgeting around in my seat, wondering if I could do something myself. Only when Zhaan enters his mind and you see him listening intently, trying to absorb every single second of her essence until the end do you feel the serenity of her passing… and of course the waterworks didn’t stop there. Zhaan and Stark’s is a powerful love story that unfortunately didn’t really develop that much throughout the series. I get it, we have enough couple drama with D’Argo/Chiana/Jothee and Aeryn/Chrichton’s on and off romances, but you didn’t really see how much they meant to one another until this one episode. I have to thank you guys for this website, you seriously tap into what audiences perceive of this great series. Cheers! Thank you for all of your efforts on this blog. Ellie loves participating in investigation and it’s really easy to understand why. We hear all about the lively form you convey functional thoughts on the blog and even improve participation from people on the point so my girl is actually studying so much. Have fun with the rest of the new year. You are carrying out a remarkable job. I’d have to test with you here. Which isn’t something I often do! I get pleasure from studying a submit that can make folks think. Additionally, thanks for permitting me to remark! I’m still learning from you, as I’m trying to achieve my goals. I absolutely love reading everything that is posted on your blog.Keep the posts coming. I enjoyed it!